The author after his first Boston Marathon experience. I woke up on Marathon Monday with two goals: Keep my phone battery charged and avoid chaffing at all costs. Thanks to 25 m.p.h. winds, wind chills below 30 degrees, and torrential rain, I failed at both. But, I won the race. My mind tells me that, at least. No, my time was not less than three hours, but I met and joined a global running community that persevered through insufferable conditions to complete the annual pilgrimage at running’s Mecca. I arrived at the athlete village to a sight to behold. Men and women from Arizona to Japan and India to Massachusetts crowded the open lawn engaged in their own unique pre-race rituals. Poland Spring bottles, Clif bars, and plenty of Vaseline containers littered the ground. Strangers told stories of marathons past. At the mention of one 90-degree day, first-timers sighed and gazed into the dark overcast skies. Boston’s police and fire commissioners, former Patriot Ryan Wendell, and a septuagenarian with a 31-race streak were among the 27,048 runners. With hours to go before the waves of runners hit the streets, the skies opened. Runners huddled into port-o-potties at the starting line and against the brick façade of CVS. We took cover under anything possible. Naturally, our muscles shortened and we wanted an early start. The race’s start was exciting, and adrenaline surged. This finally felt real. We tried to calm ourselves down. Each runner had a pace in mind. If someone ran too fast too early or too late, they’d miss their stride sooner or later. I knew the towns on the route by heart. The air in Ashland, Framingham, and Natick was filled with the smell of barbecue from tailgate parties. Our stomachs, full of protein, electrolyte gel, and lots of water, gawked at the foreign aroma. The rain pounded harder and harder. Puddles waterlogged our shoes, tights, and hats. Men and women ripped off their parkas, frustrated and exhausted by the extra weight by the time we crossed into Wellesley. Of course, Wellesley meant the Wellesley tunnel. Girls leaned over the barricade and hoped for a quick peck on the check. Kids and parents waved from under their raincoats. Their enthusiasm arrived at the perfect moment. We felt like superstars. Yet our bodies begged us to stop. We longed for a raincoat and umbrella, but kept our heads down. By Mile 15, our muscles ached on a deeper level than normal. Training for six months for the Boston Marathon makes the pain tolerable. Bi-weekly winter long runs typically build from 15 miles-plus and plateaus at around 20. Unfortunately, the “second-wind” is exhausted by mile 17. Pain creeps up on your joints, calves, and thighs. It lingers, subsides, and then returns with an surge of tension. You ride this constant ebb-and-flow until your body turns on its own autopilot mode at Mile 19. 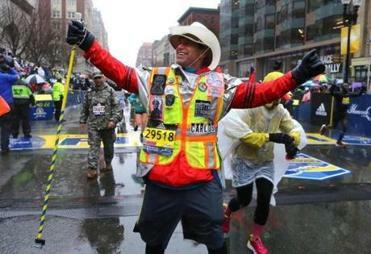 The Boston Marathon proves most psychologically daunting at the Newton Hills. Runners stopped for bathroom breaks to steal a few seconds and stretch our hamstrings. The hills never seemed to end. Every incline hit us right where it hurt most. Our knees stubbed into the concrete, chipping away at our morale. We wanted to look back. The white flag felt so easy. But I mean it when I say the spectators kept us going. Their constant support gave us the greatest energy drink imaginable. Heartbreak Hill proved no match for hope. Hope in the money all our charity teams raised for cancer, Alzheimer’s, and dozens of good causes. Hope in being Boston Strong for a fifth consecutive year. Hope drove us up that never-ending mountain at Mile 20 and brought us on a gentle ride down Commonwealth Avenue. We rode Hope through Boston College and Coolidge Corner. Along the way, I saw my mom, dad, and two brothers. I ran this year’s Boston Marathon in honor of my father, who survived prostate cancer a year ago. The 15-40 Connection, a Westborough-based non-profit committed to early-cancer screening, offered me a bib in November. I accepted and, together, the team and I raised more than $60,000. Seeing my family and closest friends from my time at Boston College felt surreal. Bandit runners jumped the fences and ran with us as our fuel levels reached empty. My four friends ran aside me and pushed me further along Beacon Street. Copley loomed taller and taller. We passed Fenway, where the conditions were too much for the local nine to play baseball. Boylston Street followed. My heart dropped and I swear that I blacked out. I never imagined any moment feeling this big: the nostalgia, the months of training and the crowds. Everything. The moment felt so real and, in that moment, each runner felt like brother and sister. The next thing I knew, a woman covered me in a silver jacket and gently lifted a medal over my head. Four hours and forty-eight minutes. Those numbers meant nothing to me. I finished. No, thousands of runners finished. And we felt Boston Stronger. Together. At the end of a raw day, that’s all that mattered.